Disgraced former prime minister Nawaz Sharif and his daughter returned to Pakistan to face prison sentences on corruption charges, a day marked by two bombings that killed at least 128 as political tensions rise ahead of a pivotal election later this month. Ousted Pakistani prime minister Nawaz Sharif and his daughter Maryam, both sentenced to lengthy jail terms in absentia, returned to Pakistan to face arrest in a high-stakes gamble to galvanize their beleaguered party in a general election campaign marred by deadly violence. 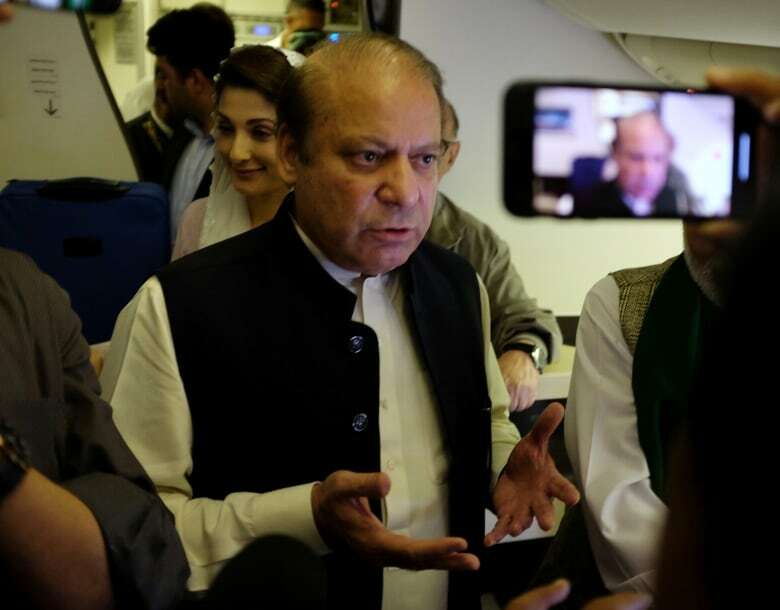 Uniformed men escorted the Sharifs, who were sentenced in absentia on corruption charges last week, from the airplane soon after it touched down Friday in the central city of Lahore at around 8:45 p.m., a Reuters reporter on the plane said. Local Geo TV reported the pair were placed under arrest shortly afterwards and taken to another waiting airplane to be transported out of Lahore, where more than 10,000 Sharif supporters were gathered to support him. A suicide bomber killed scores at an election rally in southwestern Pakistan in the second election-related attack of the day, and the biggest attack in the country in over a year. The Associated Press reported that the death toll from the suicide bombing stood at 128. Islamic State in Iraq and Syria (ISIS) claimed responsibility for the attack, the group's AMAQ news agency said. The group provided no further detail or evidence for its claim. 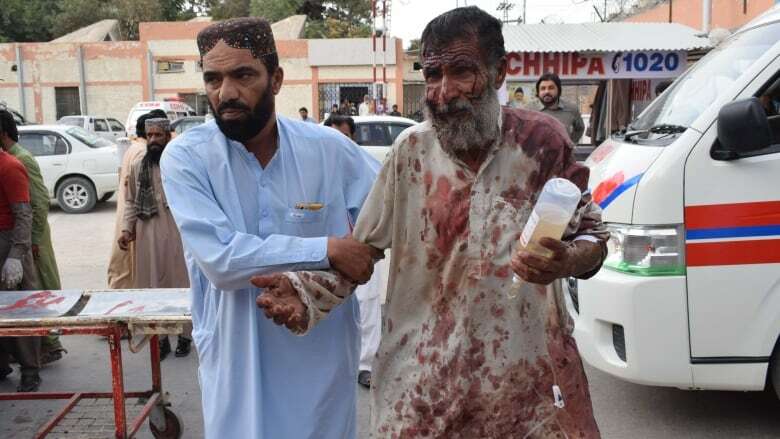 Among those killed was Baluchistan provincial assembly candidate Siraj Raisani, whose brother, Nawab Aslam Raisani, had served as the provincial chief minister from 2008 to 2013. "My brother Siraj Raisani has been martyred," said Haji Lashkari Raisani, another brother who is also contesting a national assembly seat from Baluchistan. Earlier in the day, a bomb blast killed four people in the northern town of Bannu when it struck the campaign convoy of Akram Khan Durrani, an ally of Sharif's party from the religious Muttahida Majlis-e-Amal party (MMA). Sharif is returning from Britain one week after an anti-corruption court handed him a 10-year jail term over the purchase of luxury London flats, and sentenced his daughter and political heir to seven years in prison. PML-N loyalists have said they will march to the airport in defiance of a ban on all public rallies. Canada condemns in the strongest terms this week’s attacks against candidates and voters participating in <a href="https://twitter.com/hashtag/Pakistan?src=hash&amp;ref_src=twsrc%5Etfw">#Pakistan</a>’s elections. These are cowardly attacks against democracy. 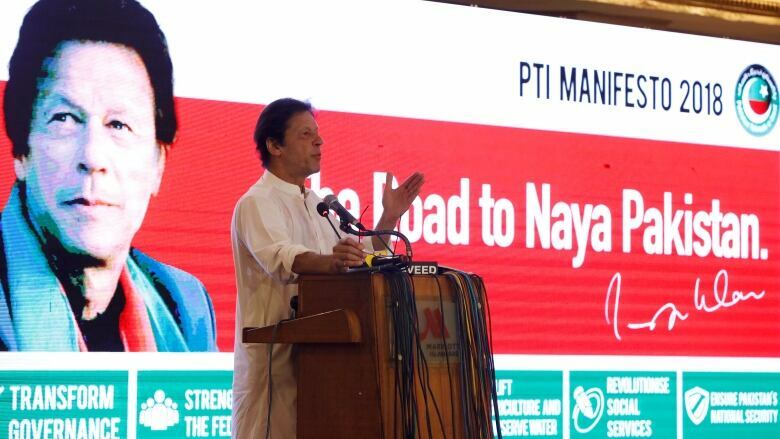 The return of the Sharifs could shake up an election race marred by claims Pakistan's powerful military is working behind the scenes to skew the contest in favour of ex-cricket hero Imran Khan. Sharif alleges the military is aiding a "judicial witch-hunt" against him and his PML-N party. The party's past five years in power has been punctuated by the civil-military discord that has plagued Pakistan since its inception. 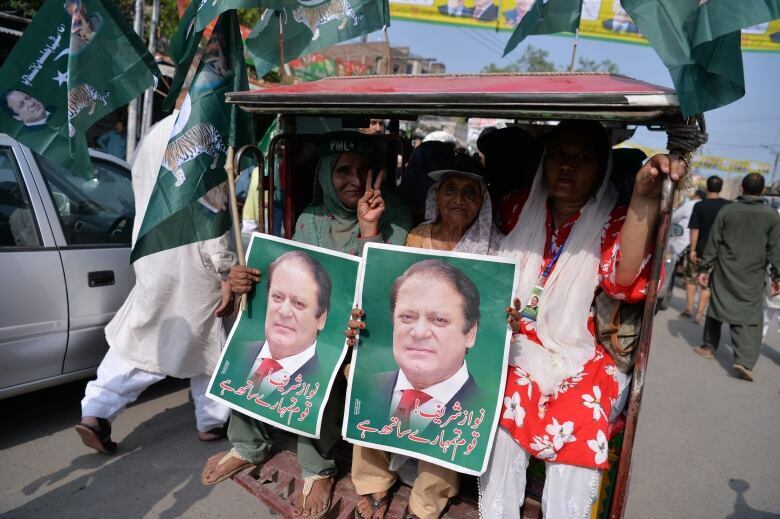 In a televised appeal to supporters from London earlier this week, Sharif said he was not afraid of prison and asked people to vote for his party. He also used the opportunity to again criticize Pakistan's powerful military, saying the country now has a "state above the state." The opposition Pakistan People Party (PPP) also alleged "pre-poll rigging" this week, but did not specifically name the armed forces. The military, which has ruled Pakistan for about half its history since 1947, has denied interfering in modern-day politics. It plans to place 371,000 soldiers around polling stations so there can a "free and fair" elections, an army spokesperson said this week. "Nawaz really believes this is about democracy and his legacy," Musadik Malik, Sharif ally and former PML-N cabinet minister, told Reuters. "That is why he is willing to lose 10 years of his life over this." Sharif's PML-N expects a groundswell of support as he returns from London, where his wife Kulsoom is critically ill and undergoing cancer treatment. 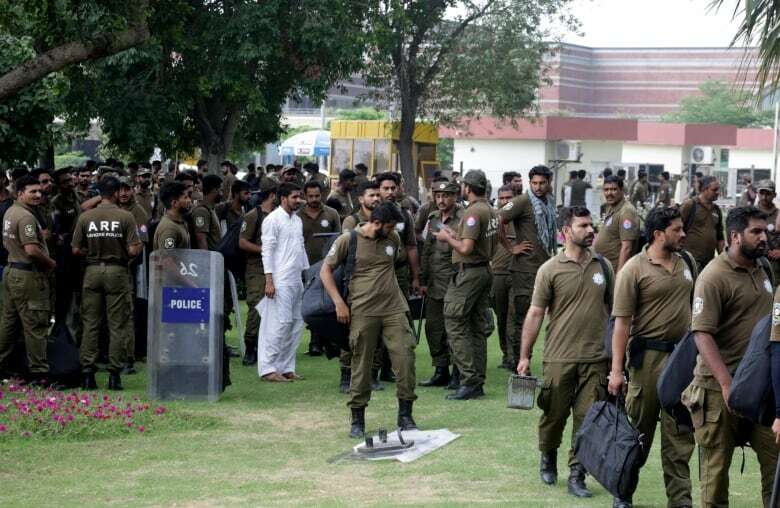 To prevent PML-N workers from staging a hero's welcome on the streets, authorities said they will arrest the father and daughter upon landing and transport them to the capital Islamabad by helicopter, local media reported. Sharif was ordered jailed after failing to explain how the family acquired the London flats in a case stemming from 2016 Panama Papers revelations that showed they owned the apartments through offshore companies. Maryam was convicted for concealing ownership of the apartments. They both deny wrongdoing. Since then, a host of his allies have been either disqualified by the courts or face corruption cases. Many PML-N lawmakers have also defected to Khan's party. PML-N has also had internal divisions. Sections of the party oppose Sharif's combative approach against the army, and fear it will turn off voters in a deeply conservative and patriotic Muslim nation of 208 million people. Friday's violence was not an anomaly. A suicide bomber blew himself up at a rally by an anti-Taliban political party in the northern city of Peshawar on Tuesday, killing 20 people, including Haroon Bilour, who was vying for a provincial assembly seat.